- Mezzanine accessible by ladder, lounge area sofa / TV / Home theater. - At the back, an outdoor courtyard of 15M2 with deck chairs, garden furniture, barbecue-plancha and a room with beach equipment (shrimp nets, ...). Decorative side, spirit Brut & Charm of fishermen's cabins: patinated white paneling and stone walls, old tiles and painted parquet. 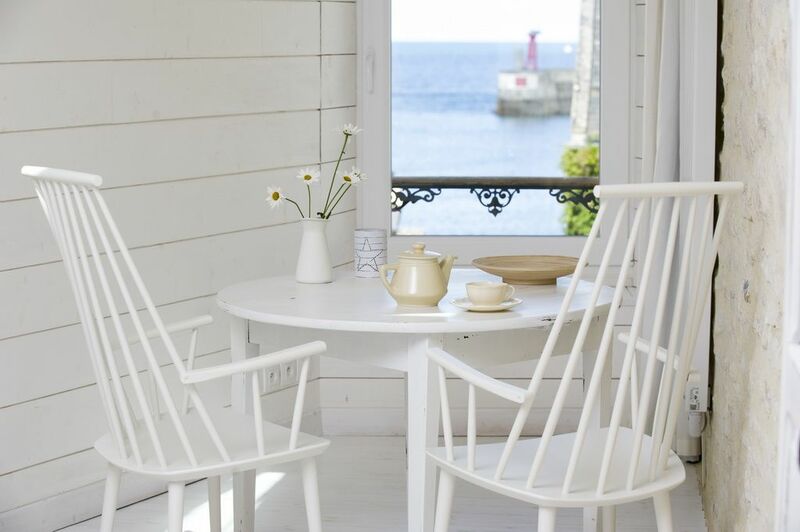 Scandinavian and shabby spirit in white and black, antique furniture and materials, vintage reissues and authentic marine objects. -Several free public car parks at 100 and 200 m. We do not recommend driving in the narrow streets of the old port but a deposit is possible for luggage. No parking in the street. Shower room like a cottage with old tiled floors and brick. White walls and plain wooden ceilings, tiled floors and old brick. New plumbing. Shower 120 * 90, charming old sink, large antique mirror, hanging toilet, VMC, heated towel rail, quality towels provided. 10 km from Omaha Beach, Arromanches, Bayeux, in the heart of the landing beaches and sandy beaches. We loved our stay in this great apartment which is just a few yards from the sea and the daily fish market. There is also a fantastic fruit, veg and general market on a Sunday morning. Staying here is a great opportunity to enjoy the comfort of a very well equipped flat with lots of opportunities for healthy eating and walking. The flat has everything you need and is full of fish related decor and artefacts. The upstairs area is a cosy place to settle and watch a film. We loved the view from the window and sitting in the sun in the little courtyard. The evening light here is beautiful. Head up to the mini car park at the top of the hill to watch the sun set. The local beach is filled with millions of scallop shells. It's an extraordinary sight! The views from the cliffs are stunning and there is a wonderful area full of amazing wild flowers. All parking in the town is free which is a real bonus. You can't park outside the flat but you can load and unload. As the flat is in the old fisherman's quarter of the town, there is a one way system that is quite easy to get to grips with. We didn't want to do D-day landings etc but this is a great place to stay if you do. If you have a spare day on your hands, head to Honfleur and browse the galleries, including the birth place of Erik Satie, an amazingly different and quirky museum. My wife and I stayed at the cabane for 7 days and found it to be perfect. It was clean, tastefully decorated, charming and well equipped. The rental agent could not have been nicer. She was incredibly helpful and made our stay even more pleasant. Port en Bessin was beautiful and a good place from which to take day trips to many beautiful Normandy cities. Do not think it would be suitable for more than 2 people. We would return in a minute! Wunderschöne Ferienwohnung mit allem Komfort, sehr nette Gastgeber, sehr guter Zustand, tolles Ambiente für alle Liebhaber des weißen, shabby Stils - sehr zu empfehlen - wir haben euch schon weiterempfohlen und kommen bestimmt wieder !!! Geschmackvoll eingerichtet, alles da was man braucht, sehr sauber, hochwertige Materialien, ruhig, wir waren begeistert. Laurance gab uns hilfreiche Tips für Restaurants und Einkäufe, wir werden sicher wiederkommen! L’appartement est très confortable et bien équipé, la petite mezzanine est un vrai plus ! La décoration est soignée, en pierre et en bois peint, tout est qualitatif. L’appartement est situé à quelques pas du port de Port en Bessin, petite commune calme mais qui dispose de quelques restaurants et d'une halle aux poissons. Les photos de la cabane des pêcheurs étaient pleines de promesses et nous n’avons pas été déçus, le résultat allant au-delà de nos espérances. Nous avons très vite pris nos marques dans cette atmosphère cosy et très bien pensé. Tout y est parfaitement équipé de la cuisine à la salle de bain en passant par la mezzanine ou la chambre à coucher, il n'y manque rien. Cette cabane offre une superbe vue sur le port qui se remplit ou se vide au rythme des marées. En bref … que de souvenirs !